2. The 3 elements of action : what?why?how? a. If you're interested, please email or give us a call, we will then email you an application form. b. After sending us back the application form, please pay the workshop fees before 30th June. If you do not pay the application fees on time, the organizer has the right to give the opportunity to others who are interested and cancel your application. * Pay it directly to person in charge of the workshop. * Banked in our account or write us a cheque. d. After banked in, please notify us via phone or email to make sure your name and deposit numbers. e. Please keep the deposit slip for further confirmation. Theatre actor, director and educator, Chu Hong Chang holds a M.F.A in performing arts from National Taiwan University of the Arts and a PHD from Beijing Central Academy of Drama. He is now a full time lecturer in the Department of Drama, Chinese Culture University (Taiwan). He has also lectured in National Taipei University of the Arts, National Taiwan University of the Arts, Shih Hsin University and many others. 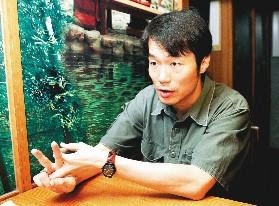 He had performed in various theatre performance with some of the most important contemporary theatre company on Taiwan. In 2006, Hong Chang was the acting coach for Ang Lee's " Lust, Caution".